When you imagine a medieval man or woman, what do you see? Foul teeth? Greasy hair? Dirty, bumpy skin? Hairy armpits and sweat stench? Well, for some of them, this might have been true. For some people today, this is still true. But medieval sources prove, that it could be and has been different for large parts of the population. 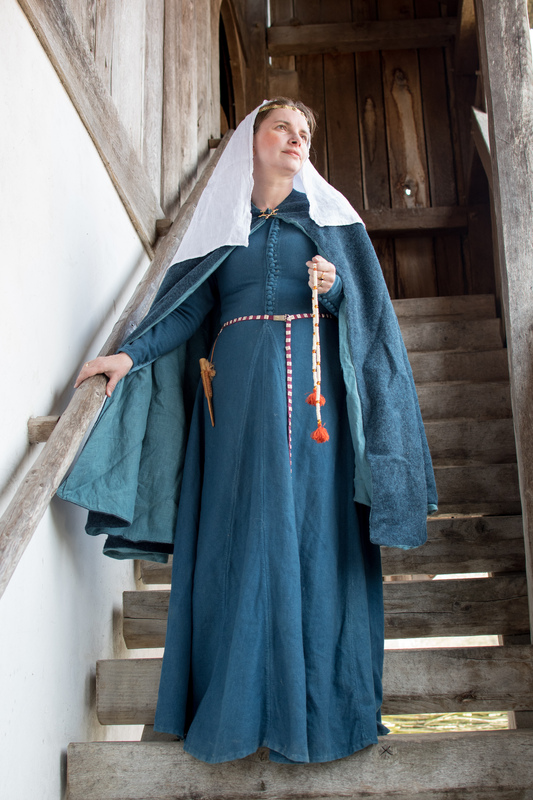 Medieval people know far more than we think today. 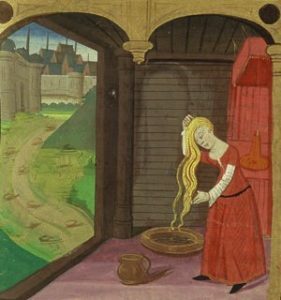 In this article I want to talk about aspects of (female) beauty routine and cosmetics, as we find them in medieval sources (mainly the Trotula). 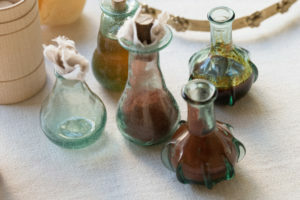 Concerning all the recipes I mention: I slightly changed some of them since many of them do their job in their original mixture but on a long term use will impact your health quite badly. Others are working with 3 usefull ingredients and one absolutely absurd ingredient, which does not contribute to the outcome in any way and of which I can not say, whether it is in the recipe due to faulty copying the original texts, due to superstitious reasons or simply because the author had no clue. Also I simply left out a whole bunch of recipes which seemed to have no noticable use or impact from a modern point of science. 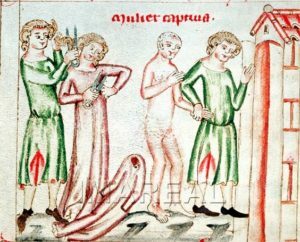 The rough basics: Bathing was not a daily habit in late medieval time. But the same goes for most of society up until the 50s. A quick bath with hot water and a sponge or washcloth was sill common in my grandmother’s time. Medieval people visited the bathhouse maybe once or twice a week. We explain a thing or two about Viennese bath houses in our video „In the bathhouse“ and in Nikolaus‘ accompanying article. For daily hygienic routine, the Trotula suggest to their female readers, to wash the body with cloth or sponges and take a steam bath. 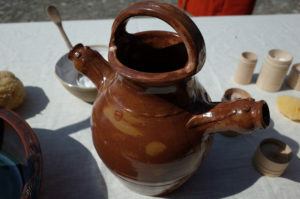 For washing, oftentimes a washbowl and a jug was in use. Towels were in use to dry the body. 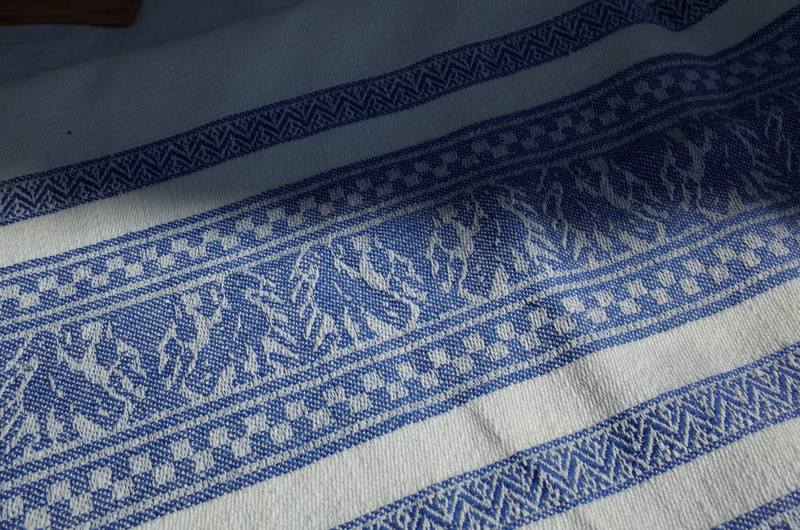 We know this from many finds and original pictures of medieval towels in their very characteristic shawl-like form featuring woven-in blue or black stripes. Especially famous are italian Perugia-Towels and their beautiful blue and white patterns. The face gets special attention in the Trotula. You are supposed to wash your face with french soap and then do a face scrub with wheat bran. Something you still do today. Wheat bran is a nice alternative to modern peeling lotions containing nasty microplastics. By the way, they also mention a face mask made with wheat starch. Also something still done today . 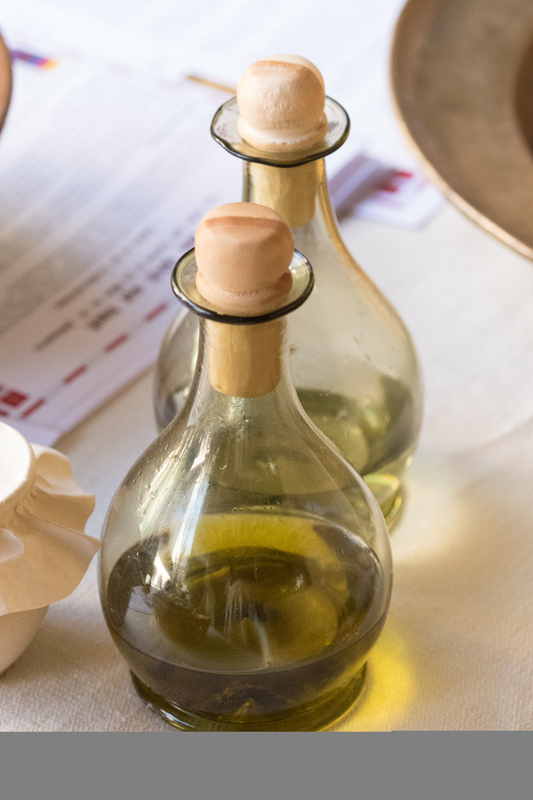 After washing the face, thorough skin care is necessary, so our lady uses a delicate hydrating cream after a recipe from the roman physician Galien. 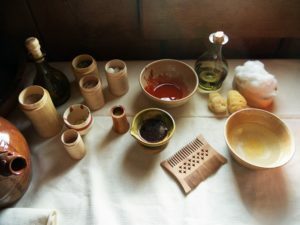 Why a roman recipe? Because Galien’s works are still taught in the Viennese University in mid 14th century. It is made from bees wax, rose oil and almond oil and feels really nice on the skin. On her temples, our lady wears a bit of violet-ointment against headaches. We don’t know, how exactly this deodorant is supposed to work. We think it might be due to the antibacterial properties of the wine and the adstringent tanning agents in the bilberry leaves that cause the pores to tighten. So it may very well be a solution for a few hours. To wash the hair (which certainly was not done every day), lye from ash was most likely used. The Trotula mention ash from vie stems to wash the hair. 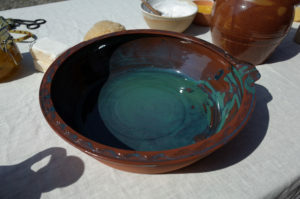 Afterwards, some medieval conditioner can be used, in the original recipe this is made from lizzard grease and some nice smelling substances. But even if you could get the lizzard grease, it would not do any better work than any other kind of oil or grease to make the hair shiny and healthy. We used olive oil, spiced with lemon peel. The powder smells really nice and kind of oriental. As a modern human, even I could imagine smelling like that occasionally. More about hair care and hair styles here. 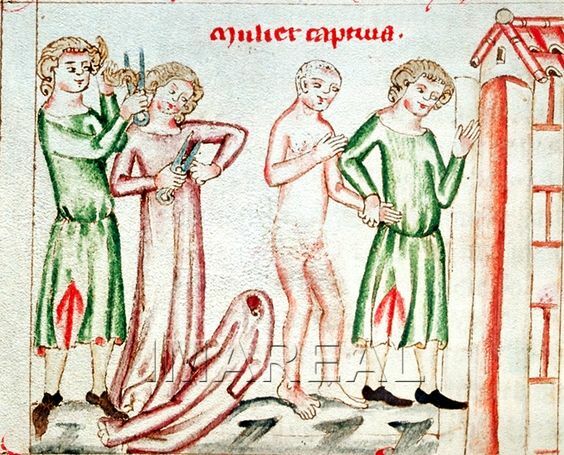 Concerning the rest of the body hair, the hairless body was not unknown to medieval people. 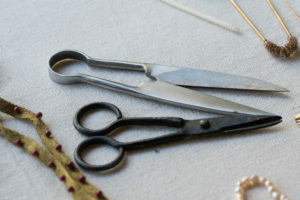 A woman would use tweezers to remove unwanted facial hair or even use a medieval variation on modern waxing. But also leg and pubic hair was removed. We can see different methods for that. Of course, you can shave it, as seen in this relief from the 13th century. But you could also tweeze the hair when your pores are open, for example after a steambath. Afterwards you have to rub your body thoroughly with towels and pinch out the hair. It might be quite a bit more pleasant to use depilatory cream though. 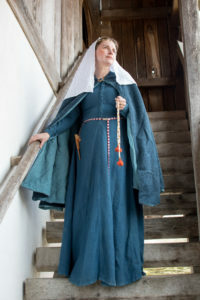 The ancient and medieval version of that is rhusma turcorum. The mixture consists of (quick)lime and orpiment, has been already known in antiquity and is still in use in regions of India today. And your hair is going to fall out for sure due to the very aggressive ingredients. The lime practically disolves some of the hair, orpiment is toxic. So please NEVER attempt this at home, just use modern and safe depilatories! Even medieval people knew that the use was dangerous for the skin and put a recipe for burnt skin from this depliatory right after this recipe. 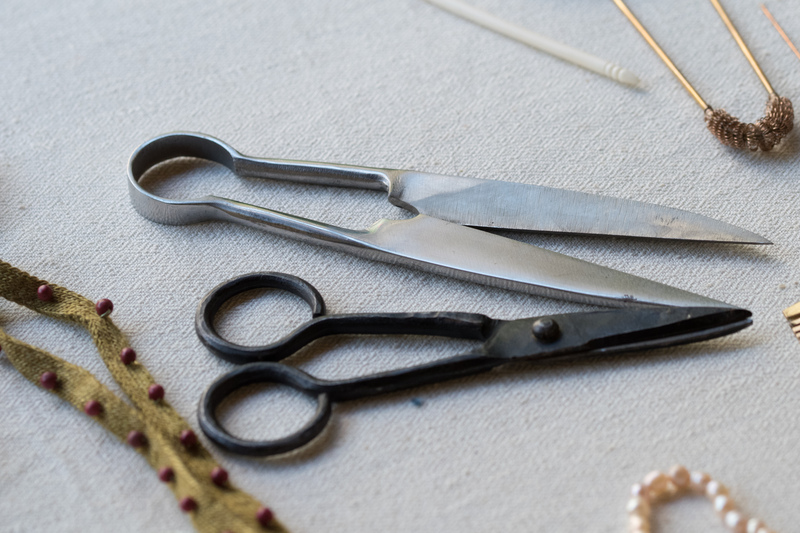 More about historical hair removal here. Teeth are not left to rott in medieval times. They were cleaned with the available ways as well as possible. 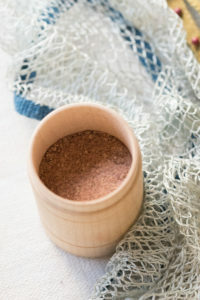 There are some recipes for tooth powders, most of them contain rock flour, spices and salt, but also grind walnut shells or charcoal are possible ingredients. 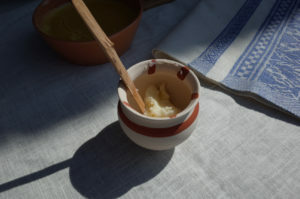 With a damp cloth, the powder is picked up and used to rub the teeth. Tooth powder like this is still in use today, though much finer and less likely to damage your dental enamel. 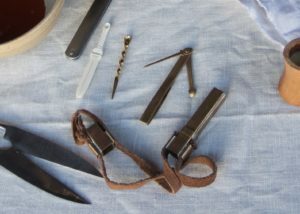 And of course, nails are regularly clipped with scissors like in this picture from the Lilienfeld chronicles and they are cleaned with the nail cleaner which is part of almost every extant hygiene set. I am mentionning it scince the earspoon was a very common item. But we have not tried this tool for the love of our eardrums. Since there are several paragraphs in the Trotula that would extend the scope of this articl, I will simply describe what I reconstructed. 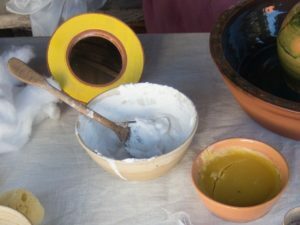 There are several recipes for face makeup which basically consist of lead white mixed with an oily or watery liquid, in parts with wax or gum arabic to make a better consistency and make the makeup storable. 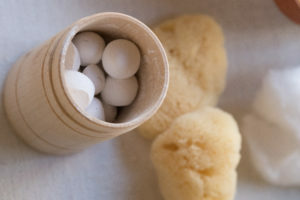 I particularly liked one where the lead is mixed with rose water and formed into beansized little balls which can be dissolved with rose water to apply. A nice idea that is a form of makeup storage still in use today with rouge and powders. Instead of poisonous lead white, we used modern white pigments though. The original recipes mix brazil wood or dyers broom with different liquids or greases. We tried it and failed as expected. Brazil wood red pigment can not simply be solved in water or grease, it has to be turned into lac dye (maybe the writer meant just that, brazil wood lac) or mixed with alum. Some of the recipes suggest the latter. But that makes the dye dangerous for cosmetic use of course. We used red ocre and it worked perfectly fine. 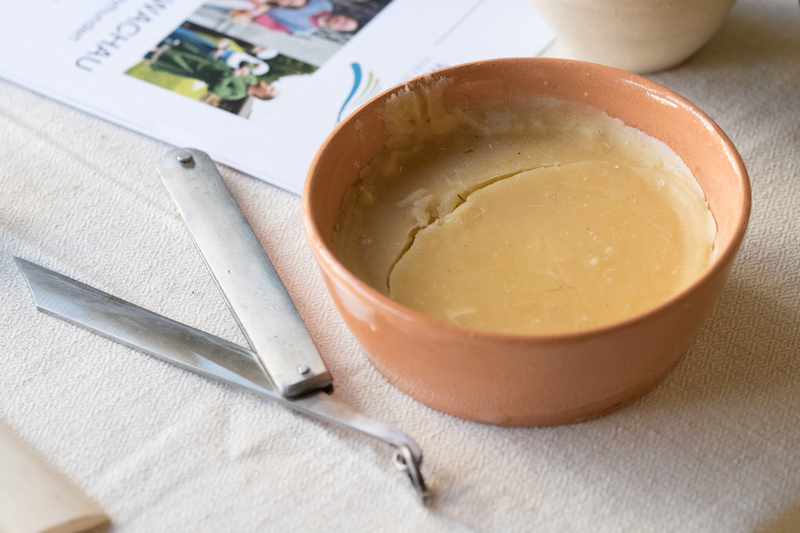 Application can be done with a bit of cloth, cotton wool as suggested in the recipe or just the fingers. One of the recipes suggests to mix dyers broom with honey and rose water. This resulted in a thick, sticky consistency that does not even look too bad on the lipps. A brownish-orange toned red lip gloss in effect, strengthening the natural lip colour and giving a glossy look to them. 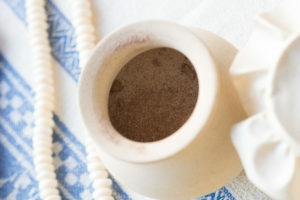 According to the recipes, you are also supposed to wash your lips with hot water twice a day and take care of them in order for them to be smooth and beautiful. A pretty modern take on lip treatments! For the application of all these cosmetics, we used a mirror that Nikolaus had made for this occasion after a find from Bavaria. Yes, you read right. A beauty-commited woman can already avoid to have her skin destroyed by sunburns and tan. It probably is interesting to know, that even today, some sun screens use white pigment instead of chemical filters. Yes, the pigment makes your skin white. But it also shields it from the sun. You can get rid of the skin burning and tanning UVB rays for some time. Unfortunately it does not shield you from the cancer causing and skin aging UVA rays, which is why today, chemical filters are the preferred choice. 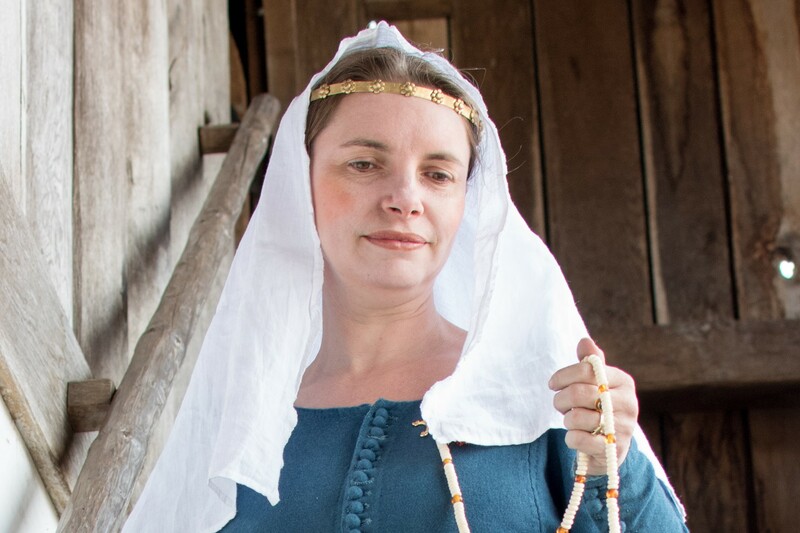 And of course, a large part of morning routine is getting dressed and putting on jewellery and veils. 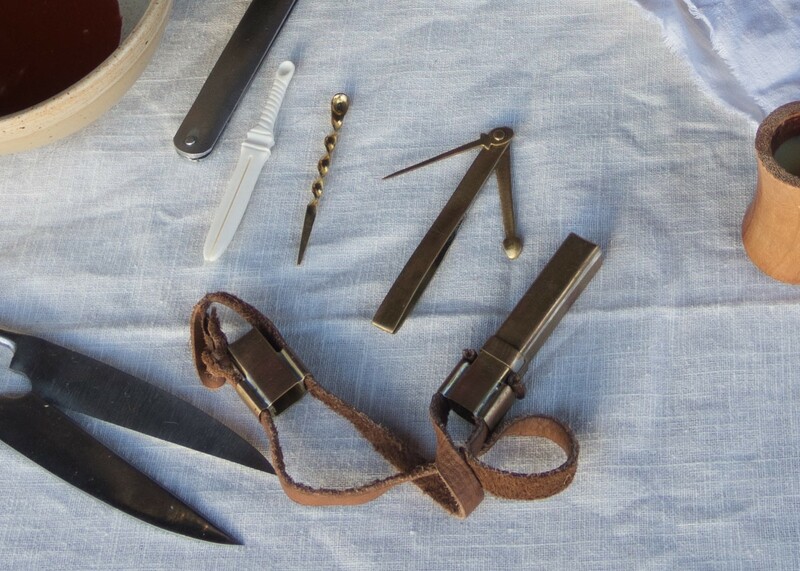 Here we take all that is precious and expensive from our “Minnekästchen” (an intrically worked jewellery box, often part of the dower): A circlet, prayer beads, a pretty fibula, rings, veil pins with pearls on them, a silk belt with silver studs and a knife with an amber handle.